Open Heavens [19 February 2019] Flee all Appearance of Evil! - Open Heavens Daily Devotional Messages, By Pastor E.A Adeboye. Open Heavens [19 February 2019] Flee all Appearance of Evil! 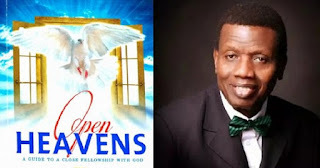 Open Heaven 19 February 2019: [Tuesday] Daily Devotional By Pastor E.A Adeboye – Flee all Appearance of Evil! In 1st Thessalonians 5:22, the Holy Spirit is very clear in warning all those who profess to belong to the family of God to stay away from everything that appears to be evil. Open Heavens 19 February 2019 Flee all Appearance of Evil! Unfortunately, some misguided Christians believe that the Bible is no longer suitable for making moral judgment in this modern age. Those with such views cannot stand the test of time, and their faith will surely suffer shipwreck. Once the authority of the Bible is established as the infallible, inerrant, inspired word of God that contains everything necessary to direct the life of a child of God unto perfection, the rest is easy. Those who accept the authority of the Bible will recognise it as the standard to prove all things, evaluate godliness and determine the morality of any action. In your daily walk with God, this verse should serve as a benchmark for you to determine what constitutes the appearance of evil. We are to set our minds on things that are honest, just, pure, lovely and of good report. If you are wise, you will recognise that the Holy Spirit knows better than you do, and so when He says flee, you will flee instead of trying to cope with an appearance of evil! Make up your mind to accept the standard of the Bible as your ultimate guide in life. Labels: Open Heaven 19 February 2019: [Tuesday] Daily Devotional By Pastor E.A Adeboye – Flee all Appearance of Evil!